From sweet, delicate designs perfect for bridal nails to bold color and fun scenes that represent the perfect beach designs, nail art and designs have taken off in ways that are sure to get your imagination fired up. Get some inspiration and ideas for your next manicure from these nail design pictures. Summer is the perfect time for fun, playful fingernail and toenail designs. This palm tree design is fun but still sophisticated. Perfect for wearing to the beach. Inspired by the vibrant hues of autumn's changing leaves, these fun fall nails show incredible artistry and detail. It's a fun design that's bound to draw attention. A rich, bold color is perfectly at home in spring, but it can also offset the dullness of winter. Indulge in bright color in any season, and amp up the originality with a pretty design like the flitting butterflies shown here. 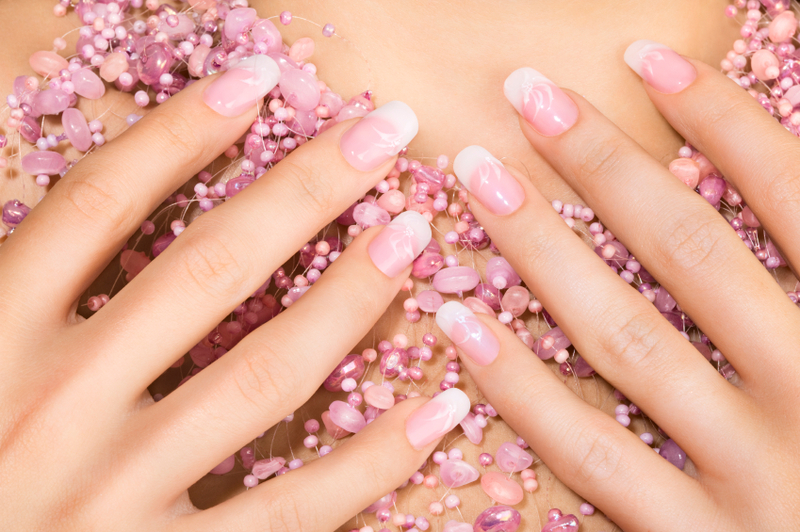 While French nails are a traditional favorite, they can also have a trendy look. This three-layered design puts a new spin on the classic French manicure by dividing the tip and body of the nail with a line of gold glitter. A floral nail look can be romantic any time of year. A light pink floral nail design against a purple background inspires a whimsical feel. The beauty of bamboo is celebrated in this lovely Asian-inspired design. The green tips and intricate white bamboo design create a fresh, modern look. Get nostaligic nails with a unique inspiration like vintage postcards. The intricate nail art shown here is made even more special by the careful artistry, which renders a 3-D effect. Softly rounded nails and delicate butterflies offer an airy, feminine nail design, perfect for times like weddings or proms. The use of jewels, acrylic and other materials allows nails to take on a 3-D appearance. These jeweled nails make an abstract pattern that comes right off the fingernail. Taking a look at different designs is a great way to inspire yourself. From striking black nails to the many options for long nails, you can take something away from every type of design to make a set of nails that turns heads.